My poetry began in the late 1980s. Some of my ideas came from my life as a nun for 7 years at the Monastery of St. Gertrude and my struggles of entering and leaving. Many of my ideas are born from books, from other people, from depression, from delight, from nature and from every opportunism I can think of. “Michele uses her talent of words to share her own inner-self through the words of her poems. Some will be heartbreaking truth of the trials she has gone through and others will display her love for life and how she sees the world through her own eyes and with her kind and most caring heart. Michele also touches her darker side in words about her struggle with depression. I ask as you travel down the road of her story written in between these lines of poems that you will grow to love her work and her.” Poet Jeniann Bowers. 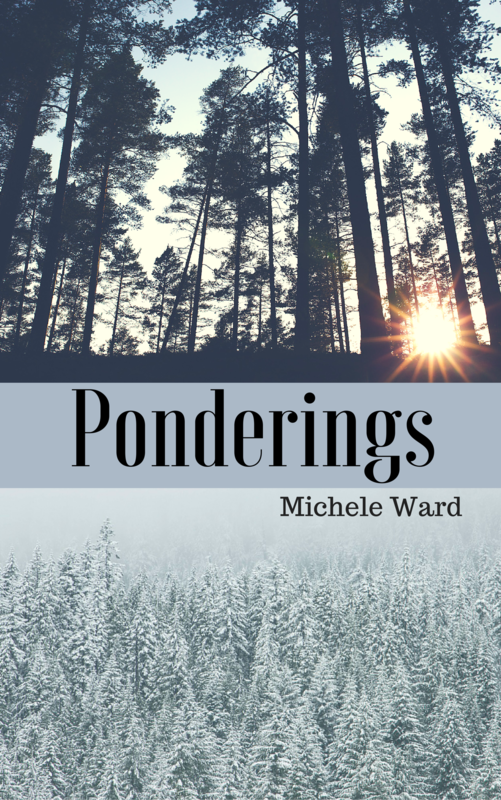 Buy Ponderins TODAY in Paperback or Kindle on Amazon! I AM . . . Woven Wind, clearing troubled, anxious minds. Let me fluff the tresses of your straw-strewn hair. I AM . . . Sky, filled with hopes and dreams. Dream of my possibilities for you. I AM . . . Earth, nurturing seeds and expressing life. Hold me in you hands and smell me. Squish me soft between your naked toes. I AM . . . Sea, with many-voiced waves whispering peace and squalling surrender. Roll up your jeans and frolic in my beauty. I AM . . . fire, guided light and energy for your journey here. Diffuse me only if you dare. I AM . . . Smoke, warning you of eminent danger. Watch for me. I AM . . . Creek, on a refreshing and quenching quest, accompanying you on the curls and coils of travel. I AM . . . Garden, to behold and nourish. I need weeding, watering, watching, sunrays bright, with dazzling light and song. I AM. . . Grass, to cool and soften your senses. Go ahead; take off your shoes, walk on me. Let me refresh your feet for frolic. I AM . . Flower. They call me blossom. Enjoy my short-lived beauty, frail and fragrant. Caress me quiet and elegant. I AM . . . Rain, to soothe and shower you with trickling memories. Come outside and keep me company in the marvel of my downpour. Play in me. I AM . . . Thunder, to release you from your daily doldrums. I AM . . . Lightening. They call me Neon Sky. Thunder speaks of me. Look for me when thunder shakes your world. I’ll be there to entertain you and spark adventure in you languid life. I AM . . . Ocean Tide, the ebb and flow of life: In-flowing good, out-flowing bad. But you never know what the tide is going to bring in. Hold my hand so we both won’t be swept away with the out-going bad. It is not always good to be alone. I AM . . .Sunbeam. I love to make your body warm all over. But I can be dangerous. Don’t get too close for too long or I’ll burn you. Allow me space to glow when and where you can. Don’t shut me out all day. A little dose of me can be good for your moody moments. I AM . . .Air, the substance you breathe. Do not take me for granted. Help me to stay pure for you. Inhale me; take me in. I AM . . . Tree. Birds rush to settle safe in my branched arms. Come dawdle in my shade. Climb up and behold the freedom I feel up here to stir the sky senseless. I AM . . . Bird. I dance on wind-tides to the tempo of my wings, sprinkling nymph and gnome notes over fields of dreams dreamt. I AM . . . Music. Dance with me please! I love to dance to the rhythm of nature. Listen . Do you hear it? Or is the silence too loud for you? I AM . . . Silence. I bring you calm and intuition. To you I promise magic. Take time to soak in my essence. Let me soften you – within and without. I AM . . . GOD, your friend. …………….come closer. I started writing poetry in the late 1980s. Do you have a favorite poem in your book, ‘Ponderings’? Who are your favorite poets to read? My favorite poets to read are Dylan Thomas, Jeniann Bowers and E.E. Cummings. Much of my inspiration to write comes from books, friends, depression, delight, nature and every opportunism I can think of. What do you hope readers take away/learn from you poetry? This entry was posted in blog tour, Poem, Poetry and tagged blog tour, Poem, Poetry. Bookmark the permalink.